Calvary’s patio is officially re-vamped and open for the summer! 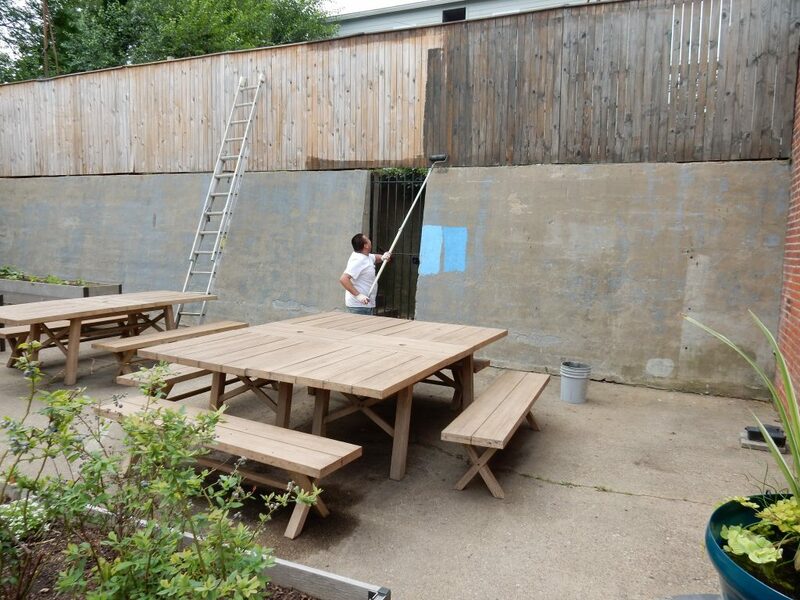 Thanks to generous funding, in kind donations and labor support from the U.S. Green Building Council – National Capital Area, Calvary’s patio has never looked better or felt more alive. 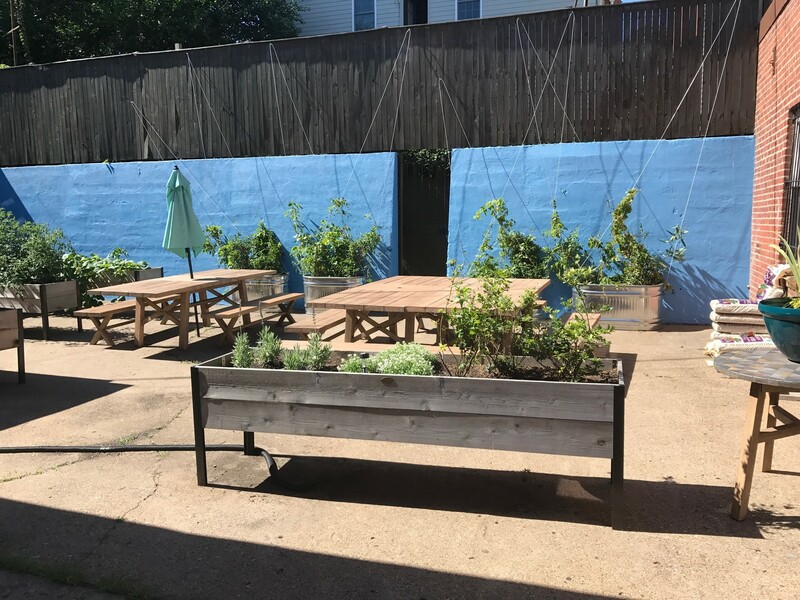 Women at Calvary enjoy using the patio as a welcome respite from their busy days, enjoy education classes that meet outside at the tables, and also take ownership over maintaining and watering the garden. 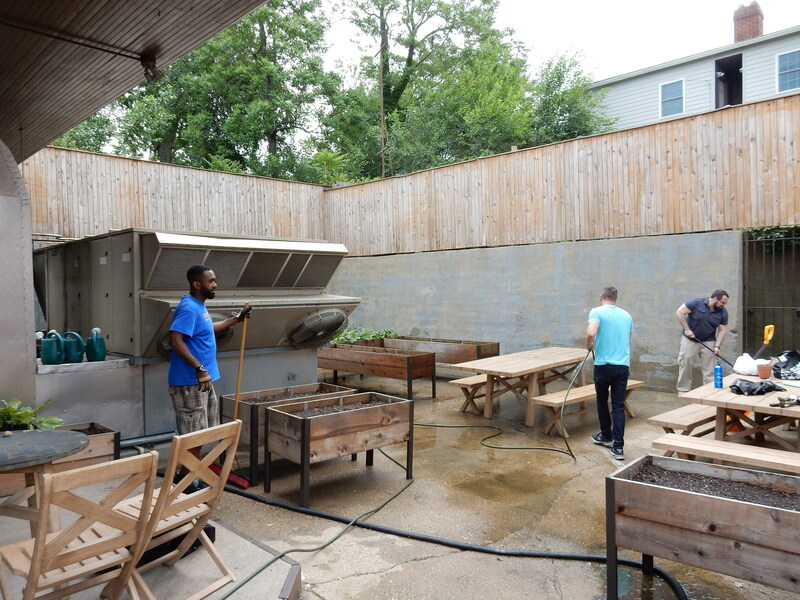 All of this was made possible by our friends from the USGBC-NCR, who hosted a GreenGive fundraiser for us last year and worked with vendors to secure in kind donations for the space. Funding also came from the Malcom Lewis IMPACT! Award, which was awarded to the USGBC-NCR Emerging Professionals team in support of their work at Calvary. 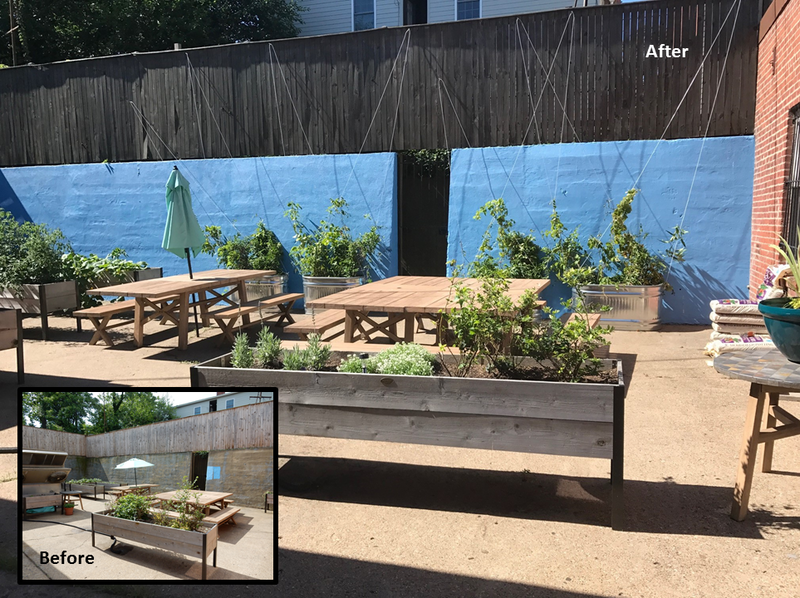 Below we’ve shared before and after photos of all patio areas so you can see the great impact that the USGBC-NCR’s efforts have had. IN PROGRESS: The wooden fencing gets a fresh coat of stain. IN PROGRESS: Volunteers from USGBC-NCR work to clear out weeds and debris before planting and painting. IN PROGRESS: Women from Calvary plant peppers and cucumbers in the garden beds. Vegetable and herb garden beds before and after, with a view of our three new peach trees against the sunny back wall. Staff parking area, which is adjacent to the patio, before and after. Look at that beautiful blue wall complementing the beautiful blue sky! AFTER: Sitting under the umbrella with a view of the climbing vine green wall and vegetable garden beds is a wonderful way to spend a sunny day. 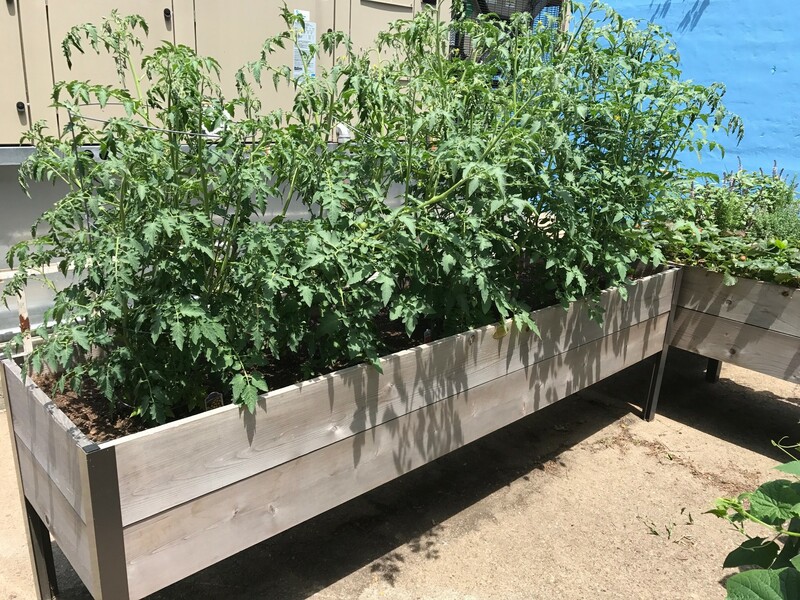 AFTER: Tomato plants growing tall and full of fruit. AFTER: Calvary’s patio is a beautiful space full of life and greenery! 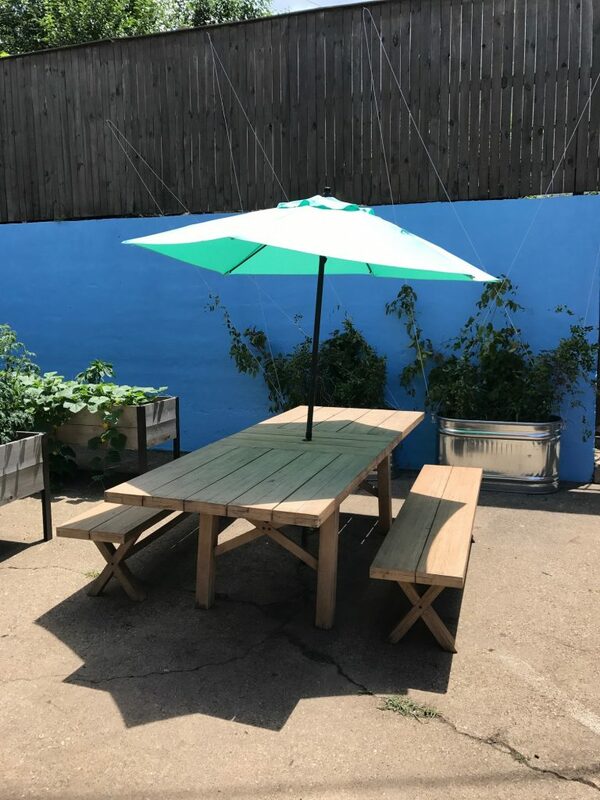 Our sincere thanks to our friends at the USGBC-NCR, whose hard work and dedication to improving Calvary’s space for homeless women in Washington, DC has resulted in such a welcome improvement to our patio space.